Stop stressing, working moms. Your child is just fine. Maybe even better than fine. While daughters see the biggest tangible financial gains, sons of working moms are more likely to grow up contributing to the childcare and household chores. All over the world, children of working mothers are less likely to stick to traditional roles of male breadwinners and female homemakers. According to new research by Harvard professor Kathleen McGinn, children under 14 who were exposed to mothers who worked -- either part-time or full-time -- for at least a year grow up to hold more egalitarian gender views as adults. Goodbye, Mother's Guilt: Daughters of working mothers earn 23% more than daughters of stay-at-home moms in the U.S., according to research by McGinn and others. 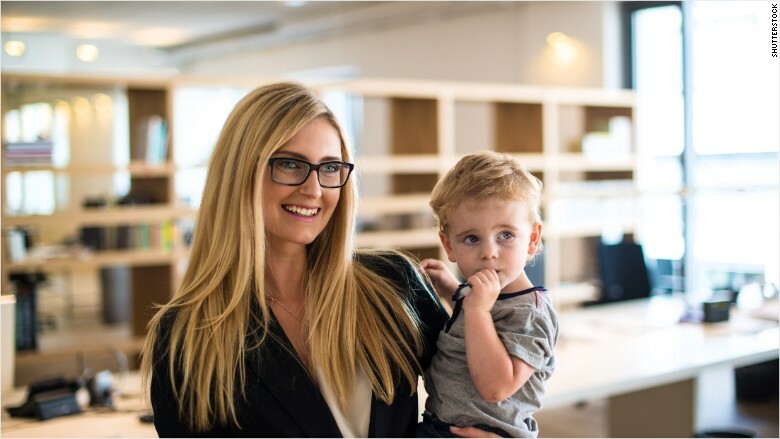 Worldwide, adult women who grew up with a working mother are not only more likely to be employed, but they are also more likely to hold supervisory positions than women who grew up with stay-at-home moms, the working paper reveals. McGinn and her colleagues studied 50,000 people from 24 countries. They used data from two International Social Survey Programme surveys -- one in 2002 and one in 2012 -- as well as local surveys and found very consistent results. Working moms are role models, and their kids absorb various lessons from them. The findings held even after the researchers controlled for cultural discrepancies in different countries. There was only one anomaly: career prospects of children who identified as conservative were unchanged regardless of whether or not they had a working mother. Women in the workforce: The Harvard study comes at a time when American mothers have been dropping out of the work force -- either by choice or because they can't find a job. The share of mothers who were unemployed in the U.S. rose from 23% in 1999 to 29% in 2012 in the U.S., according to a Pew study. McGinn says the drop-off of working moms is most likely attributable to the recession. It's not be a sign of a reversion to traditional roles for moms and dads. Sociologist Sarah Damaske of Pennsylvania State University questions whether the effects on children can be seen in just one year of a mother working outside the home. In her interviews of children, she found that some would say something to the effect of, "My mom didn't really work, she just helped out,"even if the mother was working almost full-time. "The desire to not challenge gender norms that dad can be a good breadwinner causes mom's work to be downplayed," Damaske says. "Knowing that the [mother's] job is meaningful to the family is important." Striking a balance: Adult men who grew up with working mothers spent 7.5 hours more on childcare per week, the study found. They also spent longer doing households chores. And they are likelier to have wives who are employed as well. By splitting household responsibilities in a more balanced way, it likely gives more time and space for women to pursue their careers. Maternal instincts might make it hard for moms to leave their kids and go to work, but the research suggests that might be equally as good, if not better, for them. "It's hard to leave your kids for college too but that doesn't mean they shouldn't go; it doesn't mean that its not good for them," says McGinn.